Mubadala, the Abu Dhabi investment and development company and Solvay, a world-leading chemical and advanced materials company based in Belgium, announced the establishment of a joint venture company that will become the first manufacturer in the UAE of ‘prepreg’ composite materials critical to the aerospace industry. The joint venture has been awarded its first primary materials supply contract by Boeing, reinforcing Mubadala and Solvay’s longstanding relationship with the world’s largest aerospace company. The JV, to be located in the center of Abu Dhabi’s growing aerospace hub, the Nibras Al Ain Aerospace Park (Nibras), will be established through Strata Manufacturing, Mubadala’s advanced aerostructures manufacturing business. Carbon fiber weaves consist of bonded composite materials used in aircraft builds that provide exceptional performance at a lower weight. As part of the agreement, the newly established business will supply the primary structure prepreg composite content, delivered via a unique thermos heating process. Next-generation aircraft use of these materials continues to grow as manufacturers of large commercial transport programs, like Boeing with its 777X, seek to reduce the weight of an airliner, thus improving fuel efficiency and reducing CO2 emissions. The JV will supply Boeing with advanced prepreg materials to complete the empennage and floor beams of its new 777X program. The partners expect the JV to be operational by 2021. 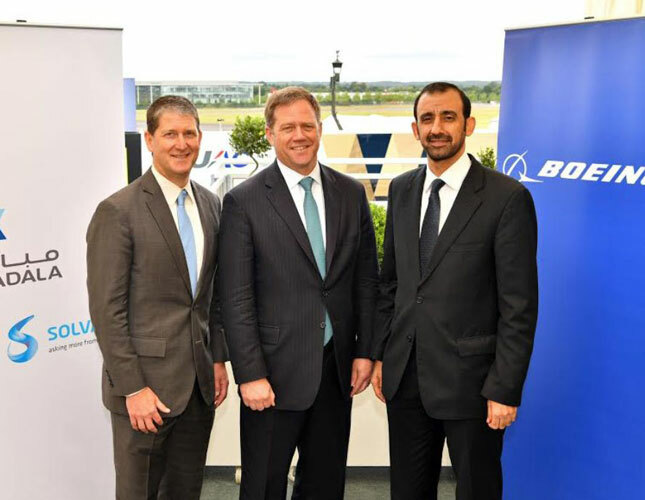 “After close collaboration with Mubadala and Solvay to expand the supply of aerospace composites, Boeing is pleased to be the first customer for their new joint venture in the U.A.E. Our commitment to purchase this prepreg material for the 777X meets several important goals for Boeing, from further advancing aerospace industry development in the U.A.E. to expanding high-quality materials in our supply chain,” said Ray Conner, President and CEO, Boeing Commercial Airplanes. This announcement follows the strategic partnership both companies established in 2013 to reinforce the development of prepreg manufacturing capabilities in Abu Dhabi. Established and owned by the Government of Abu Dhabi, the company's strategy is built on the creation of partnerships and on long-term, capital-intensive investments that deliver strong financial returns and tangible social benefits for the Emirate of Abu Dhabi, and that contribute to the growth and diversification of its economy. Mubadala manages a multi-billion dollar portfolio of local, regional and international investments and partners with leading global organizations to operate businesses across a wide range of industry sectors. These include aerospace, semiconductors, metals & mining, oil & gas, renewables, information & communications technology, healthcare, real estate & infrastructure, and services. Solvay Group’s new Global Business Unit Composite Materials is a global provider of technologically advanced light weighting material solutions that enable customers in the aerospace, automotive and other demanding industries to design, develop and manufacture high-quality, high-performance and complex composite structures.